As the holiday season comes to a close and trees and lights are put away, it’s time to begin preparing for the next important date. April 17th. Like it or not tax season is inevitably upon us. While it might seem like you have months before you need to worry about it, the deadline to officially file your taxes will be here before you know it. Depending on your financial status, assets, and life status, filing your taxes will likely take longer than you think. It might take you a while to gather all the necessary information. Although some individuals enlist the help of professional accountants, they do come at a cost. If you can’t afford it, don’t fret. You can still get some much-needed help from tax software. 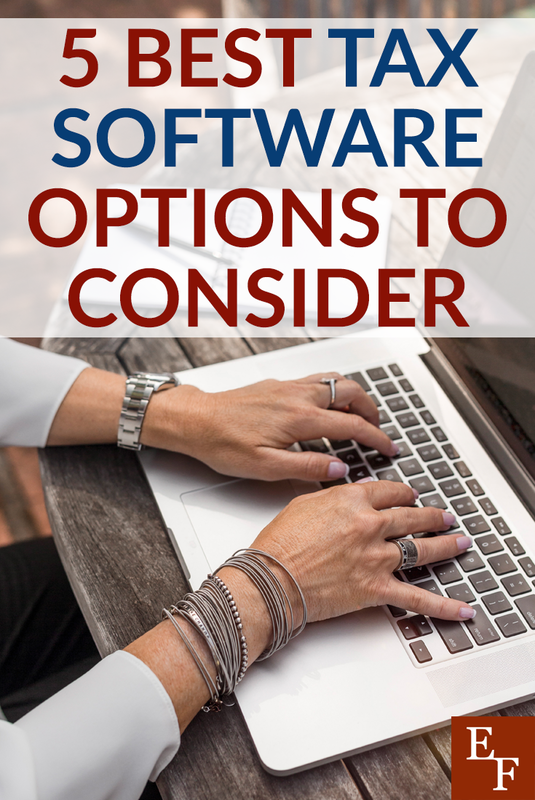 While having many tax software options means there’s plenty to choose from. It can actually become difficult to know which one is best for you. Before officially making your choice, consider these five best tax software programs for your 2018 taxes. H&R Block, while once solely brick and mortar, now provides filers with their services via their online tax filing software. Thanks to their abundance of locations and long-standing business, H&R Block can provide you with a trusted name all in the comfort of your own home. H&R Block’s software is far from stripped down due to its array of services and features. You can assess your audit risk, import documents, and search for deductions all at the basic software level. Opt for the premium or deluxe accounts and you can also utilize a tax calculator, stock & retirement income reporting, and schedule C assistance. Moreover, by purchasing H&R Block’s software, you’ll also gain the ability to speak with their professionals at no extra cost. The best part? In terms of price, H&R Block’s basic software runs you at about $30, with its premium software topping out at about $75. Overall, H&R Block offers you quite a bit of bang for your buck. When it comes to tax software, TurboTax inevitably makes the list for top picks. The software itself is relatively easy to use. This makes it a great option for anyone, whether you’re simply filing a 1040EZ, or are self-employed. At its most basic, TurboTax allows you to file a 1040EZ or 1040A at no cost to you. That being said, if you’re hoping to receive deductions or credits, you might want to upgrade. Like other tax software, the more you spend, the more services you’ll receive. Furthermore, if you’re self-employed, TurboTax also offers a specific package to help you with both personal and business expenses. And should you need assistance, TurboTax gives you the ability to video with a professional. Although TurboTax’s software runs a little more expensive, if you’re hoping to maximize your deductions and want a software that’ll do all the work, TurboTax is the tried and true brand for you. While the programs above offer a variety of services at a fairly good price, they can be costly. If keeping the cost as low as possible is your goal, then FreeTaxUSA is the software for you. FreeTaxUSA offers many of the same services, document upload, credit and deduction maximizations, self-employment assistance, and investment reporting all for free. And at a small price more for the deluxe version, you can even receive audit assistance, amend returns, and receive priority when it comes to support. That being said, state returns do cost extra. Nonetheless, if you’re someone who knows what they’re doing with their taxes and doesn’t mind a more stripped down software, then save some money with FreeTaxUSA. If you’re anything like me and would love to learn more about your taxes, then TaxAct might be your best option. At a pretty inexpensive cost, beginning at $25 for anything above a 1040EZ, you’ll hands-on file your taxes and have access to some basic features. You’ll be able to utilize a W-2, import documents, get unlimited support, and receive assessments to help lower your bill in the future. Again, like with many others, the more you spend, the more services and features you get. Still, in comparison, TaxAct isn’t quite as streamlined as H&R Block or TurboTax and it might not offer quite the support of those big names. But, it does offer a little more than FreeTaxUSA. Furthermore, you can begin filing your return as soon as you sign up, even before you officially pay. Ergo, if you’re looking for something in the middle that still offers all the features you need, TaxAct might be worth choosing. TaxSlayer is another affordable tax software option. It allows you to be as guided as you want. You can either take the reins yourself, or answer various quizzes and allow the software to pick up some of the work. TaxSlayer offers many of the same features as the other top-four programs, however, where it lacks in comparison is in its deduction tools and support. Although it assists with deductions, industry-specific, charity donations, and rental properties aren’t necessarily identified. Moreover, it lacks a user forum or live chat feature. However, if you have premium service, it will ensure that your questions get put to the top of the queue. Nonetheless, TaxSlayer will provides you with much-needed features and tools all at a reasonable price. Filing your taxes isn’t always an easy process, and unfortunately, the more you accumulate or the more complicated your finances get, the more complicated your taxes get as well. While accountants and professionals do exist to assist you, they either come at a cost you’re unwilling or simply can’t afford to spend. Thankfully, tax professionals have created an abundance of tax software options that all enable you to file your taxes on your own. And no matter which option you go with, any of the options above are sure to guide you and help you successfully file your taxes for the 2018 year. Have you used tax software before? If so, what are some tips you found helpful?